May the JJ be with us. Photo from The Daily Banter. JJ Abrams is God, and we are at his mercy. When the news of a seventh installment in the “Star Wars” franchise was announced over a year ago, tears of joy streamed down the faces of fanboys and fangirls alike. Then months went by with only whispers of rumors and speculation. However, when it was announced that JJ Abrams (“Star Trek,” “Super 8”) would be directing with a script by Oscar-winning writer Michael Arndt (“Little Miss Sunshine”), the world almost imploded from the shrieks of geeks. 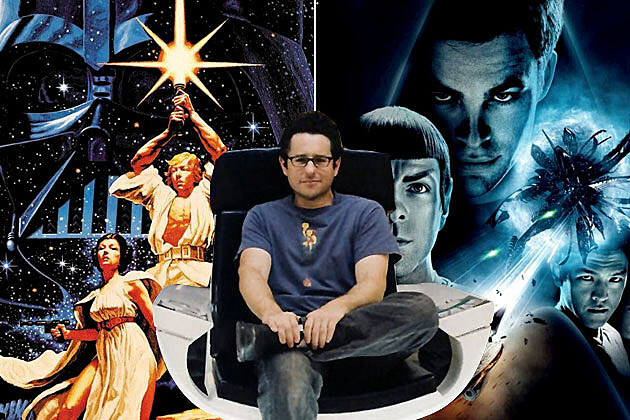 JJ Abrams sits on a dual throne of geekdom. Photo from ScreenCrush. Most found this decision extremely exciting. Sure, this was the guy who also made those other sci-fi movies, but he was good — no, he was great. His unique vision and talents would surely bring Arndt’s script to life in a beautiful fashion, wiping away the phantom menace of the prequels. As time went by, hopes were at an all-time high. How could this film go wrong? With reports that the script would center on the fan-favorite stories of the Skywalker and Solo children, the only thing left to worry about was the casting. A photo was released of Abrams and others working with R2-D2 in the workshop, and it was revealed that a fullscale Millennium Falcon had been made for the film. It was clear that the film was in the right hands. But recently, as the film’s production dates draw closer, things have begun to go downhill. A few months ago, it was reported that JJ Abrams had decided to throw out Arndt’s script in favor of his own. He would be writing with “Star Wars” alum Lawrence Kasdan (“Empire Strikes Back,” “Raiders of the Lost Ark”). “Alright, Larry Kasdan is back!” fans of the series thought. This seemed like yet another perfect addition to the crew. Yet, some conflicting feelings couldn’t be disregarded about Arndt’s unused draft. He had been handpicked by Lucas to write the first treatment from the start, and he reportedly wrote for character and feeling, much to the producers’ excitement. While confidence is still at the highest level, these recent blows have fans worried. “The Hollywood Reporter” claims, with much credibility, that Abrams and Kasdan’s version of the film will center on classic characters, including Han Solo, Luke Skywalker, and Princess Leia. This is where things get heated. To begin with, most fans don’t want a re-hash of the films they’ve seen a million times. The story of the “big three” is over, and now it’s time to move on. The films are apparently intended to tell a new story for a new generation of viewers to grow with and love. “Episode VII” will serve as a “send-off” for the old characters, but does anyone really care at this point? The actors certainly aren’t what they used to be, and it’s hard to imagine how their age won’t show on screen. George Lucas and Abrams discuss the return of Jar Jar Binks. Photo from Nerd Repository. As sad as it is to admit, it appears that Abrams has become mad with power in some ways. He originally turned down the job after being Lucas’ first choice because of his devotion to the “Star Trek” franchise. Now it seems like he’s living out his childhood fantasies by making the movie he always dreamed of. Abrams claimed that he would take the series back to its grittier, “space western roots.” This obviously isn’t a bad thing, because it worked for the original trilogy. Abrams is a master filmmaker and a wonderful dreamer, but it’s a little disheartening to think we won’t get an on-screen version of the fan-adored Skywalker children just yet. It is difficult to make a sequel or extended edition to any existing series, especially one with the biggest and most devoted fanbase of all time. Abrams and company certainly have their work cut out for them. As the saying goes, “the fans actually DON’T know what’s best.” While all the hubbub is probably just fanboys crying about not getting the movie they want, they will still pay to see it 20 times on opening weekend. The world will have to wait to see whether it can be pulled off, or if Abrams pulls a Lucas and makes a small, midi-chlorian-sized mistake. What are your thoughts on the “Star Wars” reboot? Do you think Abrams is a good choice? Leave us a comment and let us know, or tweet us @SpeakeasyMag! Hey – great article SpeakEasy. Keep ’em comin.